My name is Mandy. I’m a Michigan Mama, food blogger, and cookbook author. I spend my days raising my two little girls at our home in West Michigan. (I’d show you exactly where if you could see me pointing to my hand right now.) I spend naptimes, evenings, and every spare moment in between working on recipe development, photography, and writing for my book and blog, plus sketching designs for this shop. I started my sketching project as part of the design process for my cookbook (will be released in Spring 2019). I found that I was enjoying the sketching and lettering and design aspect so much that I needed something more to use the designs for, so that’s where my inspiration for my shop began. 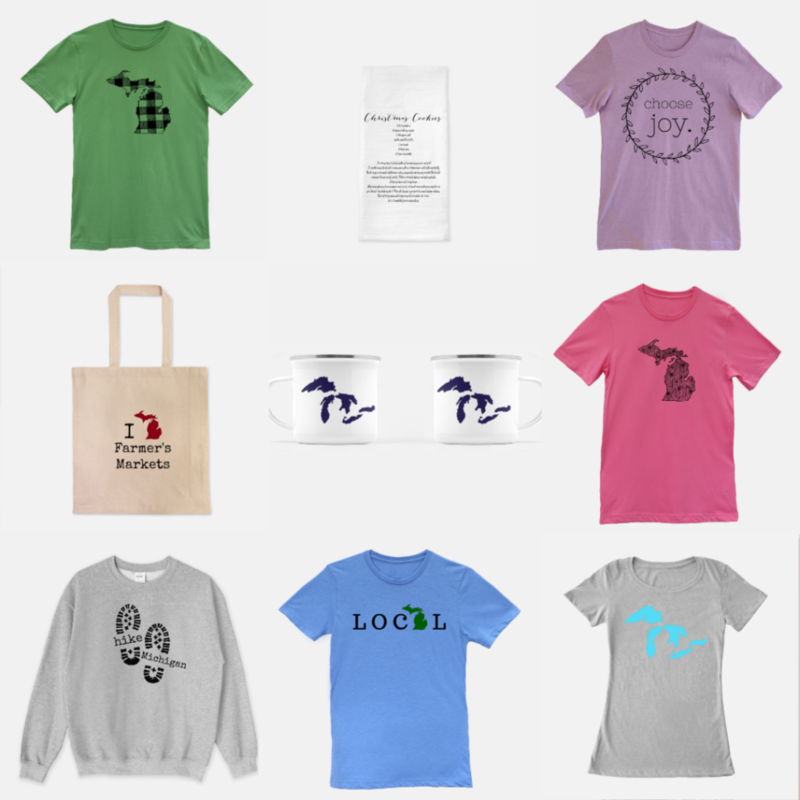 As you browse my collection, I hope you’ll get a feel for my love of home, family, Michigan, and comfortable clothes. Thank you so much for supporting this huge dream of mine. By supporting this shop through your purchases, you’re helping to make it possible for me to stay at home and raise my girls full time. Thank you SO MUCH for supporting my small business. It means so much to me and my family. The Grateful Start Journal is a list-style journal designed with the intent of encouraging a lifestyle dedicated to gratitude and loving the life you live. Daily prompts and inspirational quotes make this a simple ritual that has the potential to transform the way you look at life. By spending less than 5 minutes each morning dedicated to listing things you’re thankful for and goals you are dreaming to achieve, you have set the stage for an extraordinary day. It’s sort of like when you buy a new car, all of a sudden you notice that same make/model of car everywhere you look. By intentionally and thoughtfully acknowledging the things in life you are thankful for, whether they be big or small, your mind will automatically seek out more things to be thankful for. I have struggled with severe anxiety attacks and postpartum depression over the years and have found this practice to be an invaluable addition to the professional help that I have sought in my own life for my mental health. I’ve included a favorite quote on every single page to give each day a little bit of a boost of encouragement, whether it be quotes from a movie, a public figure, or a beloved cartoon character. Each page is numbered “Day 1, Day 2, etc.” with a space to fill in the date. This allows for you to start journaling any day of the year, and if you miss a day here or there, there won’t be pages wasted. For me, the genius of journaling successfully is in the simplicity of it. The goal of this journal is consistency, not perfection. Write whatever is on your heart in the moment, and later on, you can look back and see all the ways you’ve grown over the course of this process. Begin each day with a Grateful Start!